Trend Trigger Factor was described by M.H. Pee in the Technical Analysis of Stocks and Commodities magazine in December, 2004. This version is adding JMA (Jurik Moving Average) smoothing to lessen false signals and some extras in order to make the trend triggering state easier. 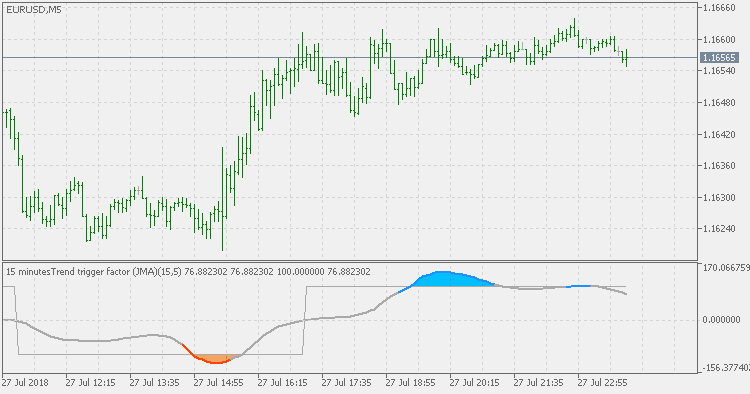 Also, this version is made a standalone (no need for the Trend Trigger Factor JMA indicator in order to work) multi timeframe indicator. Next higher timeframe: first higher timeframe compared to active chart. Second higher timeframe: second higher timeframe compared to active chart. Third higher timeframe: third higher timeframe compared to active chart. If some of these 3 timeframes are used, then the timeframe is set automatically as you change the timeframe of the chart.